Maraa invites you to Blue Print of a Park Imaginarium this Sunday, Aug 18th | Cubbon Park Bandstand 3 pm – 6 pm. We invite artists of all age groups to come and paint, sketch, draw their imagination for a park. Maraa in collaboration with other groups in Bangalore will be submitting a joint proposal to consider revitalising Cubbon Park with better access, and for diverse uses. The sketches made at the event will be submitted to the department as well. How many times have we been in an open space, and imagined what could have been there. 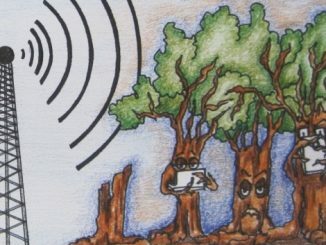 Could a park bench just start flying or could trees start walking with lonely people in the park, could the park become a live circus with trapeze artists and magicians? At maraa, we have been trying to activate dead and public spaces through creative practice – to create a space for people to wonder, participate and use. We wish to invite people of all ages to paint an imaginarium for a park – create blue prints, sketches, paintings of everything you want a public park to be. We will be submitting a proposal to the Director, Horticulture Department, responsible for Cubbon Park, in September, towards revitalising Cubbon Park with the hope to that the park is open diverse publics and triggers multiple imaginations. Your blue prints will also be part of this proposal. 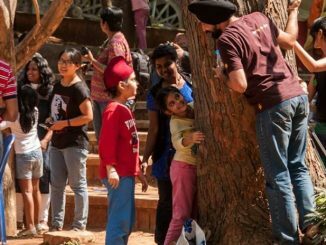 Be part of the Revitalising Cubbon Park Campaign. Spread the word. Entry Free. All are welcome. Bring your own paints. Call 9880755875 / 7406225453, for more details. Theatre Jam is a independent initiative of Maraa, conceptualized in 2009. It is a monthly forum to trigger dialogues about art and media in the public space through practice, performance and expression. It travels across different public and semi-public spaces, committed to reclaim dead, found and empty spaces in the city. Theatre Jam is free and open to anyone who is in search for conversation and collaboration. www.maraa.in. 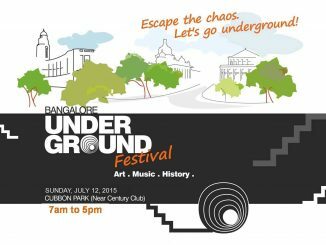 On July 12th, venture into the underpasses near Cubbon Park and KR Circle, and witness a celebration of citizen spirit at the Bengaluru Underground Festival.